Jenny Gilruth (centre) with BHF representatives. A pledge by Fife Council to teach every pupil CPR before they leave secondary school has been welcomed by a local MSP. Jenny Gilruth, MSP for Mid Fife and Glenrothes, said she was “delighted” that the local authority has signed up to the pledge. 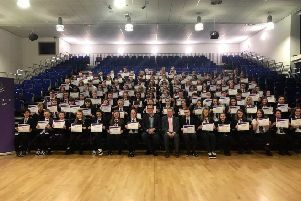 Fife Council has signed up to the British Heart Foundation’s ‘Nation of Lifesavers’ campaign, which aims to ensure every pupil is trained in the vital skills and has been praised by international experts and medical professionals, who believe it could save thousands of additional lives. Commenting on the news, Ms Gilruth said: “This is a fantastic announcement and I am delighted that Fife Council have signed up to ensure every pupil is taught CPR before they leave school. “I have been working with the British Heart Foundation on this issue for over a year and I know that all high schools in the Mid Fife and Glenrothes constituency already deliver CPR. BHF Scotland launched the campaign in 2018, urging local councils to work with them to provide the training. Fife joins the 31 other local authorities already signed up – meaning every single council in Scotland has committed to work with the nation’s heart charity to deliver the programme. David McColgan, Senior Policy and Public Affairs Manager, BHF Scotland, commented: “This is fantastic news. We are absolutely overwhelmed by the response we have received to our Nation of Lifesavers campaign and delighted to have achieved our ambition in such a short space of time. “To do so is testament to the support we have received from Scotland’s local authorities, wanting to work together to make a difference in their communities. “Far too many lives are lost in this country when people suffer a cardiac arrest out of hospital, partly because too few bystanders have the expertise or confidence to perform CPR.